With such hymns and liturgical exclamations Christian worshippers on this most important day of the Christian Year rejoice with one another, celebrating the world-changing event of the Resurrection of Christ Jesus from the tomb, two days after his degrading, tortuous death on the cross and burial. It seems that hardly any other event in the gospels ought so powerfully to attract visual artists, yet the frequency of depiction of the Resurrection pales into quite modest comparison with the countless images of his terrible death, or even of the removal of his body from the cross and deposition in the tomb. Images of the Annunciation to Mary and the Nativity overwhelm this subject in frequency, despite that the Resurrection is the true climax of the gospel narratives and apex of the gospel message, without which, as St. Paul so famously said, our faith is in vain (1 Corinthians 15:13-14). One reason for this lesser presence surely is that none of the gospels actually depict the moment; they tell us rather of his body’s absence from the tomb when the women first, then Peter, came. John’s gospel gives us the poignant first appearance to Mary Magdalen, Luke has him revealed to the Emmaus pilgrims at the blessing and breaking of the bread, then he presents himself to other gathered disciples, and finally John recounts his appearance to Thomas the Doubter. There is a gap. Consequently, artists have been obliged to imagine how the very first witnesses, the guards at the tomb (Matthew 28), may have reacted when and if they saw Jesus actually bursting forth from behind the sealed stone. This is the conjecture Piero della Francesco and Mantegna depict with more conventional iconography. In their depictions the risen Christ emerges serenely victorious from a sarcophagus, banner of his triumph over sin and death in his hand, with the tomb guards as ineffectual spectators. Peter Paul Rubens goes far beyond any of these paintings in realism and raw power. His resurrected Christ literally bursts forth from a rough and rocky hillside tomb like a young Hercules about to do battle (compare with Rubens’ Drunken Hercules, painted just a year earlier). We see a massive, vigorous, fully corporeal yet divinized body. The radiant beams emanating from his head (no longer wounded, marks in his forward foot and side barely visible) may be an allusion to the young bridegroom as the sun of Psalm 19:5-6, a poetic image borrowed from the Babylonian myth of the Sun-god, already employed in an allegory for Christ’s resurrection in the famous Utrecht Psalter. But most of all we recognize the influence of Michelangelo, who used just such an allusion for his drawing of the Resurrection (1532, British Museum), a study for his controversial Sistine Chapel Last Judgment, a work which Rubens had seen and greatly admired. The Jesus of his 1612 Resurrection of Christ explicitly resembles Michelangelo’s suddenly appearing Judge of All. There is nothing serene whatsoever about this image of the resurrected Christ. His is a terrible beauty. Flesh in that long sleep is not putrified. Rubens’ resurrected Lord is glorious, but far from manageable. That, Rubens suggests, ought to be a source of abiding Christian comfort. He is a great god and a mighty king above all gods. 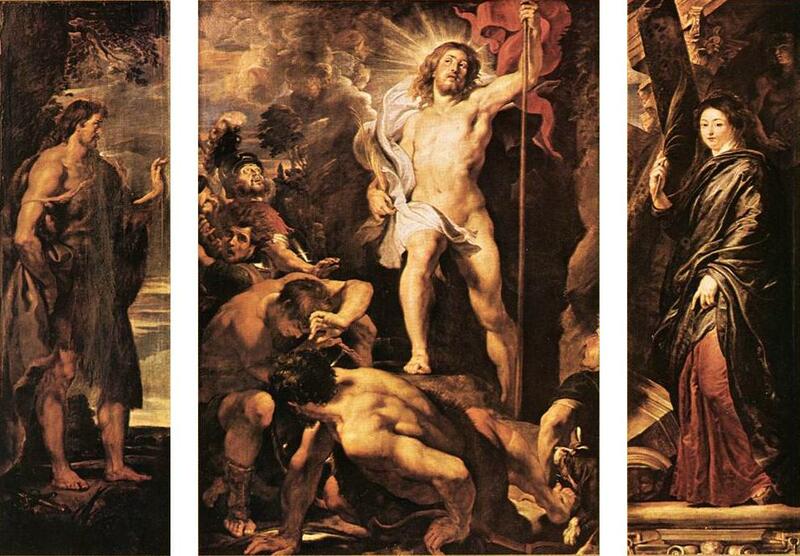 Peter Paul Rubens: Triptych with the Resurrection of Christ, 1611-12, oil on panel, 178 x 138 cm. The triptych was commissioned by the printer Jan Moretus, whose name-saint was John the Baptist, featured here in the right panel. His widow, Martina Plantin – whose name-saint was the martyr Martina of Rome, said to have brought down the temple of Apollo simply by making the sign of the cross – is on the left. The work is oil on panel, with the central panel measuring 138 x 98 cm, the wings 136 x 40 cm each. Peter Paul Rubens (1577-1640) is the most eminent of northern Baroque painters, sometimes called “the prince of the Counter-Reformation artists”. He was both prolific and in high demand; the years 1609-14 saw him complete more than fifty important works. Among these, his Elevation of the Cross (1609-10) and Descent from the Cross (1611-14), much larger works than his Resurrection (1611-12), all done originally for the Vrouwekathedraal in Antwerp, where despite removal during the French Revolution they now again reside. David Lyle Jeffrey is Distinguished Professor of Literature and the Humanities at Baylor University and Guest Professor of Peking University. His most recent publications have featured the painting of Marc Chagall and Ding Fang, and his book In the Beauty of Holiness: Art and the Bible in Western Culture (Eerdmans) will appear this summer.